Microsoft revealed plans in December 2018 to use Chromium as the core for the company's Microsoft Edge web browser instead of the company's own engine. Chromium is used by Google Chrome, Opera, Vivaldi, Brave, and several other web browsers. Some saw the decision as a long overdue move to improve the default browser on Windows, others as another step towards a Chromium monopoly on the web. Firefox and Internet Explorer, Microsoft's second web browser that is not really in development anymore, are the two only browsers left standing that use a different engine on Windows after Microsoft completes the move. 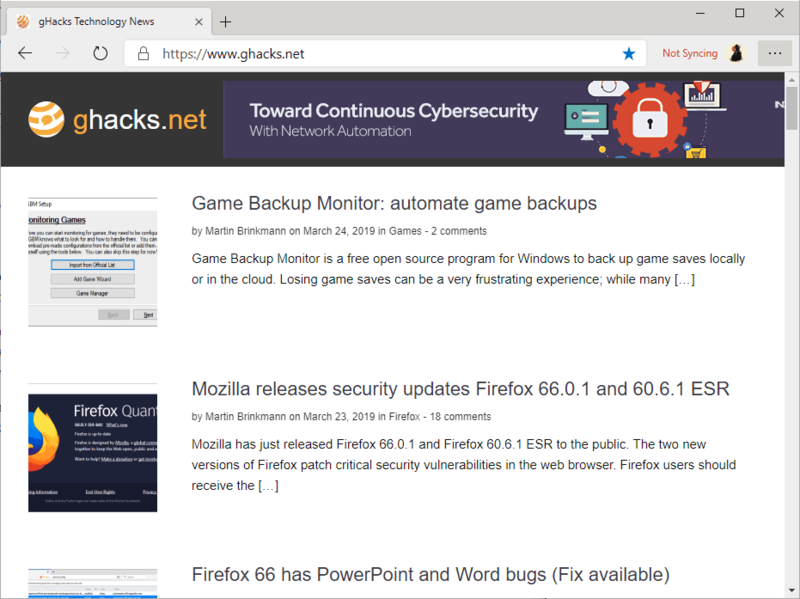 A version of the Chromium-based Microsoft Edge web browser leaked to the public recently. The download has a size of 112 Megabytes and it is recommended to test it in a sandbox or virtual machine as it comes from an unofficial source. Note that the browser is still in active development; some things may change and features that are missing may be added before the first stable version release later this year. The new Edge and the old Edge run side by side. I tested this only on a Windows 10 machine; the new Edge will run on Windows 7 SP1 or Windows 8.1 systems as well according to Microsoft. Whether that is the case for this build is unclear. The browser interface looks very similar to that of other Chromium-based browsers; this should not come as a surprise as all browsers use the same core. The browser picks up the logged in Microsoft Account of the Windows system and displays the account icon in the interface automatically. The menu looks like a mix of Chrome's main menu and that of Microsoft Edge. Most options look identical to those offered by Chrome but you find Microsoft's handwriting in some entries. The Read Aloud option is already available and incognito mode is called inPrivate mode. The Edge main menu is gone in this build which is a good thing in my opinion as I never got used to it. Settings do look different in Microsoft Edge than in Chromium. A couple of things are still missing in Settings. There is no Themes option or option to change the search engine, but most Chromium Settings are already available. Update: you can edit search engines by going to edge://settings/searchEngines. Microsoft integrated Windows Defender SmartScreen in the browser natively. The extensions link works already and redirects to the Microsoft Store. There you may install a few dozen extensions optimized for the Microsoft Edge version of Chromium already. Extensions include AdBlock Plus, Amazon Assistant, Boomerang for Gmail, Dashlane, Enhancer for YouTube, LastPass, Save to Pocket, or uBlock Origin. 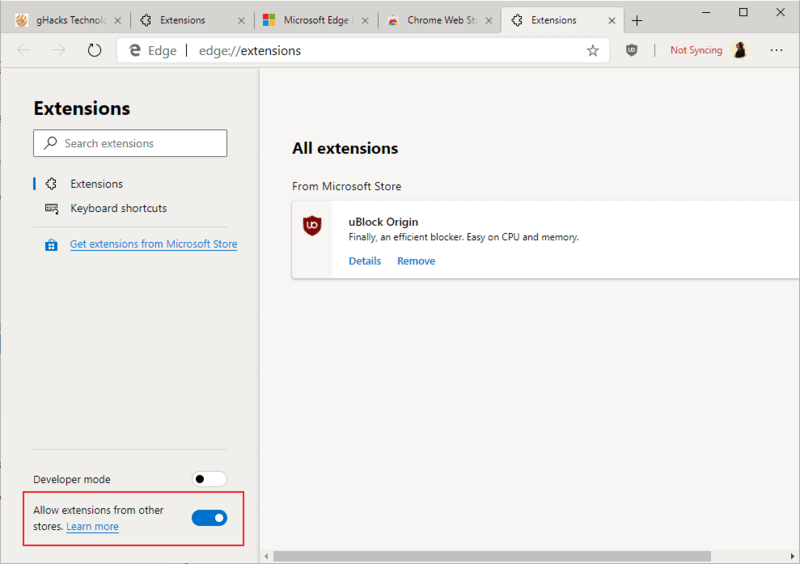 Installations work directly; it is no longer necessary to install browser extensions for Edge from within the Microsoft Store app. Edge displays the extension installation dialog directly in the browser window. The prompt lists permission requests and options to install the extension or cancel the process. The extensions management page lists options to enable the Developer Mode and to allow extensions from other stores. Microsoft Edge displays a notification to users that this is an option when the Chrome Web Store is visited (but not Mozilla AMO). You can install extensions from the Chrome Web Store after you make the change on edge://extensions. The option removes a severe limitation as Edge users could only select from a hundred or so extensions previously. Support for Chrome extensions gives users more options and improved functionality. 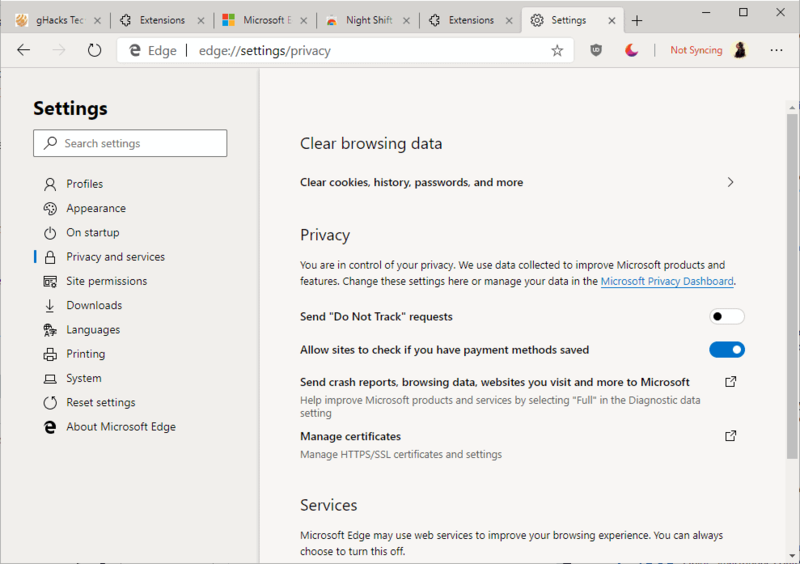 The new Chromium-based Microsoft Edge browser does away with several of the annoyances of the old Edge browser. Better web standards support and support for Chrome extensions are certainly features that make the new Edge more attractive. Whether that is enough to convince users to stick with the browser remains to be seen. The first impression is good. Microsoft Edge is fast to open, websites load quickly, and you can install extensions from the Chrome Web Store. Some settings and options are still missing but development is ongoing. It is possible that these will be introduced in a future version. Hello Martin. Thank you so much for the great job everyday. Google snooping while you browse or Microsoft snooping while you browse. Choices, choices. Or you could run SeaMonkey. It might not be prettiest, but it is rather lean and fast. Based on Gecko, and works well. No, you’ll now have both Google and MS snooping on you at the same time with this. Or you can use Ungoogled Chromium. I think the real reason that Microsoft are using Chromium is to break Google’s stranglehold on the browser market. How many people are going to go to the trouble of downloading Chrome if Edge is effectively the same browser? Most people go for the original. Also, many people hate anything M$, eg Win 10 updates, Edge, Bing, Cortana, Nadella, etc. Is MS Nadella a new Office app? No, Nadella is the new Office party pinata. so why not use the real Chromium? Good luck with that. They are going to need it. If Google starts to lose maketshare they will stop updating Chromium and start adding blobs directly to Chrome. Vivaldi, Opera, Brave don’t have the resources (small companies) to break Google’s stranglehold. So they are not a real threat to Google. I hope this browser to fail, if it doesn’t, all of us who use chromium based browsers (Vivaldi, Opera, Brave users) are going to suffer from a butchered Chromium. It will be interesting to see. My prediction is that it won’t help the Edge usage rates by more than a few percent. I think it depends on how aggressive Microsoft is going to push the new Edge. Most Internet users on Windows are used to switching to a new browser right on first run; will be interesting to see if Microsoft can break that pattern. What a depressing regression of the browser landscape. Besides switching from the Evil Google to the Evil Microsoft, what are the advantages of this browser over Chrome? there are no advantages . Microsoft’s move to Chromium will be the end of Firefox. Firefox has a market share of less than 5% (mobile & desktop combined), which means that many website admins won’t consider it to be worth their time to add support for it. If Firefox doesn’t switch to the Blink engine as well, I fear that its usefulness will gradually diminish. A Microsoft engineer criticized Mozilla for not switching to Blink, and got a lot of criticism in return, but I have to agree with his sentiments. What good is it to maintain a 5% browser, if nobody in the real world cares? Nota bene: Principally, I support competition of multiple engines, but if the market turns into a de facto monopoly, there is no pint in maintaining an engine nobody cares about, especially if its market share is declining instead of growing. We’ve been hearing news of Firefox’s demise even longer than how Linux will replace Windows. And Microsoft criticising anyone after they laid off their whole QA department shouldn’t be taken seriously. MS commenting on browsers, epic story of era since IE to Edge, now complete ultra fail by giving up on making a decent browser for more than three decades. The problem is that after Quantum, Firefox did not improve, in fact it became an inferior version of itself and an even inferior competitor to Chrome than it used to be. Quantum stripped Firefox of its XUL addons, which were the most powerful addons known in any browser, Quantum limited the customization of UI and other aspects even more. The Quantum UI is also a blatant ripoff of Chrome. The other problems with Firefox is that it loads many websites slower than Chrome and many others doesn’t load correctly, because the web developers didn’t care to make the websites support Firefox. This is why Firefox is becoming less and less appealing and the Mozilla team and all the Firefox fanboys autistically screeching “but muh privacy” doesn’t really mean that much anymore. Firefox was a browser about customization and freedom, now Mozilla is trying to make it as limited as Chrome, except Chrome is at least super fast on loading websites and being compatible with them, whereas Firefox isn’t so Firefox currently has nothing good going on over Chrome and I don’t see no reason to use it at all. Microsoft’s supposed inability to create a decent browser is totally besides the point I was trying to make. Chrome has taken over the web because all alternatives were slower and clunkier to use back in the day. By now, Chrome’s Blink engine has a de facto monopoly, to the point where website admins no longer care about other browsers. Microsoft just bowed to the realities of the web, and Mozilla is going to follow suit eventually. The topic is talking about the Edge browser in the desktop/laptop, not in mobile smartphone/tablet. Firefox has a significant 10% world marketshare in the desktop. Using your logic, if you include mobile devices with Edge, it has a world marketshare of less than 1% = Edge should be completely scrapped and M$ should preinstall Chrome in Win 10. > The topic is talking about the Edge browser in the desktop/laptop, not in mobile smartphone/tablet. Firefox has a significant 10% world marketshare in the desktop. Many, many people use mobile devices these days. Looking solely at the desktop and ignoring mobile is nonsensical, and doesn’t reflect its real market share. Firefox’s real market share is below 5% by now. > Using your logic, if you include mobile devices with Edge, it has a world marketshare of less than 1% = Edge should be completely scrapped and M$ should preinstall Chrome in Win 10. Edge is soon going to use the same rendering engine as Chrome (Blink), i.e. what works in Chrome also works in Edge. Firefox uses its own rendering engine, so it’s another matter entirely. Moreover, the development costs for Edge are way down by now, I suppose. Microsoft just has to take Google’s engine and add their own UI on top of it. So, M$ moving to Chromium will not mean the end of Firefox, but the end of Edge itself, ala Win 10 Mobile being ended by Google Android. Certain desktop apps are not cross-OS compatible because a lot lot more work needs to be done by the app developers to make them so, eg top AAA online games, specialized business software/apps, etc are only available for the 2 OS with the majority or significant world marketshare, ie Windows and MacOS. Doing a lot lot more work to make their apps compatible with Linux or ChromeOS for minuscule monetary return is not worth it for such app developers. ……. In the desktop market, there are only a few notable OS but many browsers. ……. In the desktop market, there are “only” millions of apps but billions of websites. I disagree. I think this move will have no discernible effect on Firefox at all. When 90%+ of all Internet users use Chromium, it‘s absolutely worth the time of developers to support Firefox as well, regardless of the fact that switching browsers takes about 5 minutes. Do you thin that‘s realistic? I think you’re overestimating the importance of direct web developer support. How important this is depends on the nature of the website. The majority of websites out there aren’t doing anything terribly tricky and can stick with the HTML standard. If a site does that, then nothing special is needed in terms of developing “for Firefox” and no special dev attention is required. If a site is doing really advanced stuff, that changes the equation — but the vast majority of sites aren’t. and you rid yourself of the nasty Bing-inspired new tab page. But at the end of the day, it doesn’t do anything better than Chrome, in fact it’s inferior, because it can’t install themes, so I will continue to use Chrome regardless. M$’s Edge has lost its edge to Google’s Chrome = M$’s Edge has been Chrome’d by Google. When will M$ change the Windows 10 kernel to the Linux kernel.? WIN-dows become LOSE-dows.? Hopefully soon = within a few years. As long as all major professional software (except for servers) rely on Windows, it won’t fade. Contrary to Microsoft’s browser projects, Windows is successful, so why should they give up on it? Makes no sense. @ Iron Heart It wouldn’t matter for professional software’s if Microsoft changes Windows kernel to Linux kernel since software’s don’t rely on kernel to work except for softwares that rely on drivers or kernel mode operation to work. Do you mind the grown-ups are trying to have a discussion here. Have a look at the new Google Stadia where Google is planning to move all AAA multi-player online games to the browser and Cloud, making the OS and game consoles redundant, eg M$’s X-Box and Win 10. ……. Google Suite and M$ Office 365, an Office software suite, can already be run from the browser and Cloud. Similarly for the Turbo Tax program. It won’t be a surprise if most professional software/programs are eventually moved to the browser and Cloud, making costly non-free Win 10 Ent & Pro unnecessary, ie people can just use any free OS that can launch a browser to access software/programs stored in the Cloud, eg free Linux or ChromeOS or Android. Have a look also at the new 5G Mobile cellular technology. 5G can reach up to 1Gbps download/upload speed with very low latency/ping. It will be possible for everyone’s device to be Always Connected whether in the home, office, car or on-the-go. There are a number of very, very good reasons to think that 5G will not result in higher speeds for the vast majority of users. Even if it will, such speeds cannot possibly become available to the majority of people within the next 10 years or so. “”” According to KT, the speed test was performed in real-world outdoor mobile environments, with the telco saying it was confident that end-users would be able to achieve 1Gbps speed on 5G smartphones connected to its commercial network. 5G is just an upgrade from 4G and in turn 4G was just an upgrade from 3G and 2G. 5G is not a difficult upgrade for the telcos. Next will be 6G. 3G = average speed is 1Mbps, maximum of 5Mbps. 4G = average speed is 20Mbps, maximum of 100Mbps. 5G = average speed will be 200Mbps. ?, maximum of 1Gbps. Download/upload speed of at least 200Mbps with 5G Mobile Broadband should be common-place within the next few years in 1st and 2nd World countries. ……. Rural folks will usually not be covered by 5G or 4G = rely on Satellite Internet. Indeed, I’m very well aware of all that. I still stand by my opinion. I am happily working with Firefox and Chromium browsers. Why should I swop Chromium browsers for Chrome, or Edge that are only derived from the basics of Chromium? What’s the point? Why not ditch the browser portion of windows completely? MS fought and lost the browser wars decades ago when they were forced to unbundle IE. Later they integrated edge so fully it can’t be extracted from, just disabled in, windows. I suppose because they no longer dominate the browser market? Now google does, so MS is back to square one with google’s self described browser based ad data collection software? I really wish MS would quite rummaging around trying to find something to do and fix their evil update system certain to go from evil to nefarious when this chromedgium thing is sliced, diced and spliced into windows, screwing up the entire OS. The positive side, in a morbid sense, is these big companies are doing a great job supporting a subindustry blocking and removing all their great “features.” Sad. I feel like we’ve hit a time warp and gone back to 2001. > Waterfox. Pale Moon. Basilisk. Plus there are other lesser-known browsers. Those rely on one of the big players still developing the engine they use. If Mozilla decides to call it a day and stop the development of gecko, Waterfox / Pale Moon / Basilisk will be screwed. Pale Moon and Basilisk use Goanna, not Gecko. Basilisk says, “This browser is created and maintained by the team behind Pale Moon, and is a fully independent fork of the Mozilla/Firefox code.” A reasonable guess/hope is that if Mozilla/Firefox/Gecko disappear, Pale Moon and Basilisk would be able to continue. Waterfox, of course, would be a rough go, probably gone. > Pale Moon and Basilisk use Goanna, not Gecko. Goanna is basically a rebranded Gecko engine. 95%+ of the code is identical. Every second year, Moonchild crawls back to Mozilla with his tail between his legs, and is happy to find that there is a new Mozilla-developed Gecko engine he can impress his followers with. > A reasonable guess/hope is that if Mozilla/Firefox/Gecko disappear, Pale Moon and Basilisk would be able to continue. Waterfox, of course, would be a rough go, probably gone. All those browsers – without exception – would vanish if Mozilla decided to end Gecko development. Since 2013, Apple’s Safari desktop browser has a world marketshare of < 5%. According to your false logic, because of low world marketshare, Safari should have died long ago or been forced to adopt the Blink engine of Chromium/Chrome like Edge. ……. Actually, M$ moved Edge to Chromium mainly to save costs on browser development and maintenance, not because of low world marketshare. Why do you think M$ laid off her Windows Testing Division in 2014 and imposed forced auto-updates in Win 10.? P S – During the 2000s, M$'s Internet Explorer using the Trident engine commanded about 90% of world marketshare for desktop browsers. Were most of the other remaining browsers, ie Netscape/Firefox and Safari, forced to move to the Trident engine.? > Since 2013, Apple’s Safari desktop browser has a world marketshare of Actually, M$ moved Edge to Chromium mainly to save costs on browser development and maintenance, not because of low world marketshare. Absolutely wrong. They cited better web compatibility of Blink as their reason. Also, they know that Trident won’t survive in a Blink-only world. By the way, browser development is only a fraction of the cost of Windows 10 development, in which the browser is embedded in their case. > Why do you think M$ laid off her Windows Testing Division in 2014 and imposed forced auto-updates in Win 10.? – Forced auto-updates: Microsoft wants to datamine you, thuy they need to be able to install new telemetry whenever they see fit, especially if people have found a way to get around old telemetry measures. – QA Testing Unit being fired: Microsoft relies on automatic testing by machines now. Not the greatest way, but definitely a way. > During the 2000s, M$’s Internet Explorer using the Trident engine commanded about 90% of world marketshare for desktop browsers. Were most of the other remaining browsers, ie Netscape/Firefox and Safari, forced to move to the Trident engine.? Funny. Trident is closed source, so the alternatives couldn’t move to it back in the day. And yes, a whole lot websites didn’t work in those browsers when Trident was dominant. Were you even there to witness it back in the day? Side note: “M$”? You should grow up and quickly. Microsoft isn’t the only greedy company out there, Apple and Google are about as greedy, if not more so. Nevertheless, that meme hasn’t aged too well. You trust or believe in everything M$ cites or says.? = “there is a sucker born every minute”. Insulting me doesn‘t suddenly change reality, you fool. If Blink is used by 90%+ of all Internet users, how likely will continued Firefox / Gecko support be then? Microsoft decided to bow to Blink‘s overwhelming dominance of the Internet. Can‘t blame them, the reality of the web makes it pointless to develop Trident any further. You are a fundamentalist, so you can‘t see the realities of the web. It‘s quite obvious going by your aggressive stance, defending a browser only a tiny minority of Internet users even cares about. Firefox is an okayish browser, but it is on its way out no matter the quality of the product. It is a failure, all things considered. No, M$ is just doing what Opera, Vivaldi, Brave and other Chromium/Blink-based browsers have done, ie to save costs and do less work on browser development and maintenance. Why do you think Google based her ChromeOS and Android on the Linux kernel, that is mainly developed and maintained by Linus Torvald and kerneldotorg, and not build/develop her own OS’es from scratch.? I think that should be obvious: Gecko development costs about $200 million per year, and small projects like Pale Moon, Waterfox etc. are just applying Mozilla’s patches to their own products. Without Mozilla, they won‘t be able to keep it up. Stay realistic. I think you misunderstand my question. I understand the economics of development. However, I think that most people who use forks like Waterfox and Pale Moon don’t care if the projects can “keep up” or not. They can cease new development and stick to basic maintenance (which a small team can certainly do) and everyone will be fine. So I don’t see how Mozilla ceasing support of Gecko really matters much to them. Perhaps the browsers would eventually no longer be able to correctly render important sites, but if that happens, those who are bothered by it will find another browser. No big deal. vivaldi is also based on Chromium! I’m using Firefox 67 (beta) with WebRender enabled. It’s fast, stable and probably the best that Firefox has ever been. But I also recognize that it’s very likely on its way out, and within a year or two I expect Firefox to switch to Blink or be discontinued entirely. Until then, I’ll keep using it as long as it’s supported because it runs far better for me than Chrome or any of its many knock-offs, particularly with video. If I have to switch to something in the future, it’ll more than likely actually be Microsoft Edge. Firefox had an opportunity to be great but instead it grew stagnant, bloated and slow which allowed Chrome to swoop in and take over. Quantum came far too late to save it. Fyi, Chrome for Android does not allow extensions = no blocking of Google’s ads, coin-miners, etc. So, those who use the Chrome/Chromium browsers are actually abetting a crooked ad-based business that wants to dish out her ads to every user. IOW, if you enable Chrome/Chromium to be the sole dominant browser in the world market, you will eventually be forced to view Google’s ads whenever you are web-surfing on your devices. I’d rather not have the whole web be Chromium dominated, but except for a miracle that’s probably going to happen sooner rather than later. I don’t *want* Firefox to go under but I realize that’s a possibility. I think it will be very difficult for Mozilla to stay relevant in the long run. MS thinks with this new browser will attract people ? it’s ugly like edge and yes much worse menu than when before… And the worst of all another copy for the world. Does it block Twitch ads? For me Chrome gets a ton of nasty popups trying to view some tv shows on some sites. You know the kind. Finally switched to pre-existing Edge & when those try to pop instead is an ‘about.page’ that can just sit there while playing the hour (45 mins w/o commercials) show. Chrome blocks extensions that try to download from Youtube. Current edge lets you do this. Will it still work from edge when it is Chromium underneath? I’m pretty sure it will as you can download extensions from Microsoft directly or from Google. It is the same with Opera: you can download extensions from Opera Add-ons (that let you do so), or the Chrome Web Store. would there eventually be a time when firefox, chrome and M$ all come together and put out a browser that brings out the best of all three??? But what constitutes the “best”? In such a scenario, count on telemetry gathering being part of the goal. That’s simply the way tech companies do business now. You give software away for free, and use data gathering to attract advertisers, and make money that way. No one (except Microsoft and a few business application vendors) sell software licenses, and even that is going to a subscription model. There’s no revenue streams in selling software once, and letting the user have it for life. If you were putting food on the table by being an ISV, would you do that? Any opinion on Iridium and Iron browser? Will not use Edge or Chrome. Not thrilled with Mozilla Quantum Firefox. Blazing speed does not impress me and is not needed for me. Sure a browser should be reasonably fast. PaleMoon and Waterfox work great in my situation. Edge is disabled along with Cortana. No Bing. Just use Startpage and Duckduckgo. If PaleMoon goes and Waterfox then it will be time to hunt for a new browser if there is one. Been trying to avoid Google with the exception of Youtube, without an account. Chrome never ever felt right using it, sure it is probably a great broswer. Just like the feel of the browsers I use. If Microsoft got rid of Edge, Cortana, Defender, Windows 10 would be more than Great.